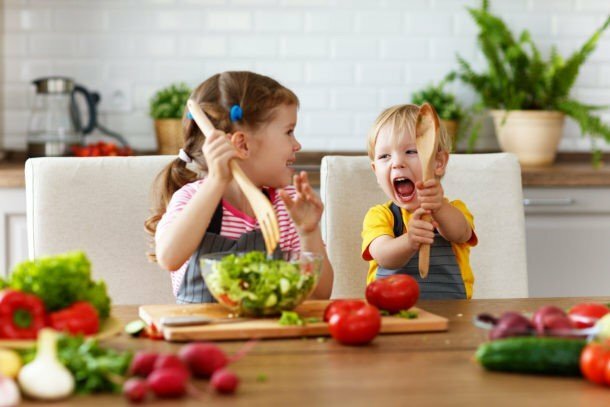 Cooking with toddlers or kids can be fun, educational, and even help them learn to eat new foods. 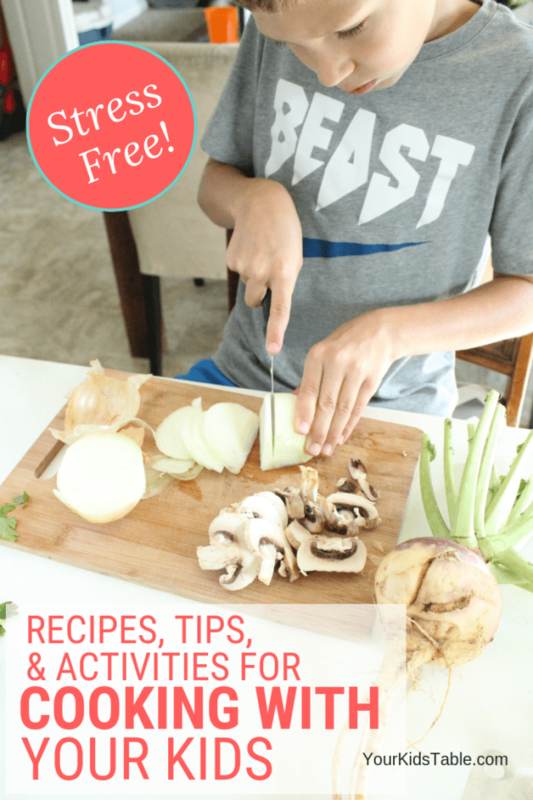 Find out what cooking activities your child can do and get a list of inspiring recipes and tips to keep your sanity! 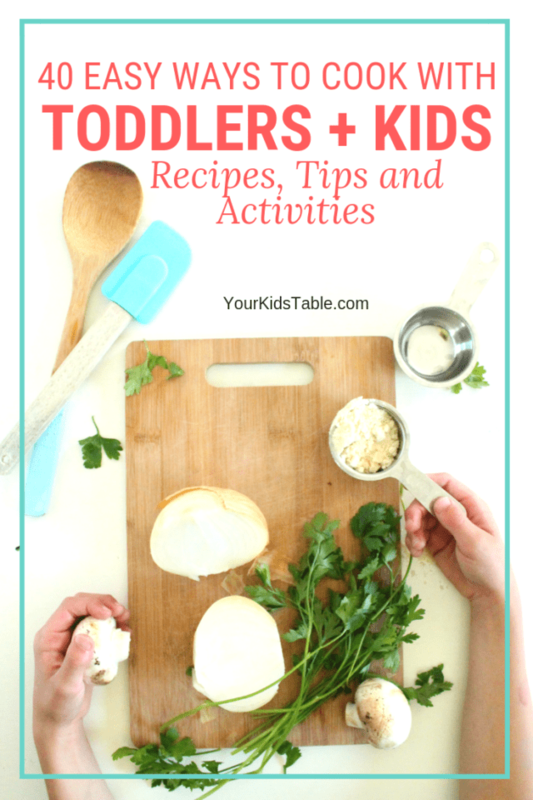 Cooking with toddlers and children, in general, may seem like an easy pass, not being worth the effort, but what if I told you there was a way to cook with your kids while keeping your sanity and giving them a beneficial experience with tons of benefits! It is possible to not only survive, but also to enjoy cooking together and to leverage this time for learning and even eating new foods! Why Bother Cooking with Toddlers and Kids Anyhow? So, let’s talk about all these benefits to cooking with children, there are quite a few! 1. Time spent together – I know, very cliche of me, but it’s true. As my kids get older, it gets harder and harder to find time with them, and cooking together is a task that has a definitive start and end. It’s also motivating to accomplish something together! 2. 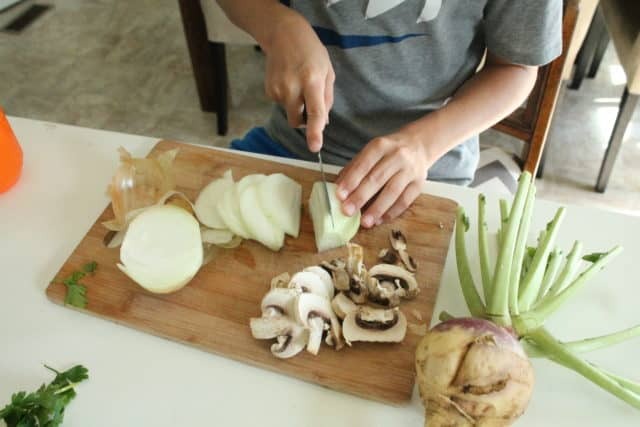 Learning concepts – No matter what age your child is, concepts are learned experimentally during cooking. 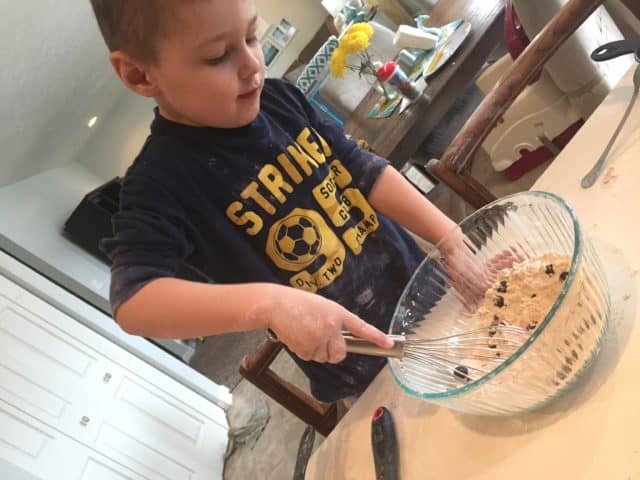 Whether your cooking with a toddler that’s being exposed to different colors and shapes, or with an older child that is learning fractions and the science that happens right before their eyes, cooking has the power to teach. You’ll be surprised at the learning opportunities that present themselves! 3. Following direction – Toddlers to teens can have a hard time attending to a task and following directions. Cooking is a fun way to sharpen this skill! 3. 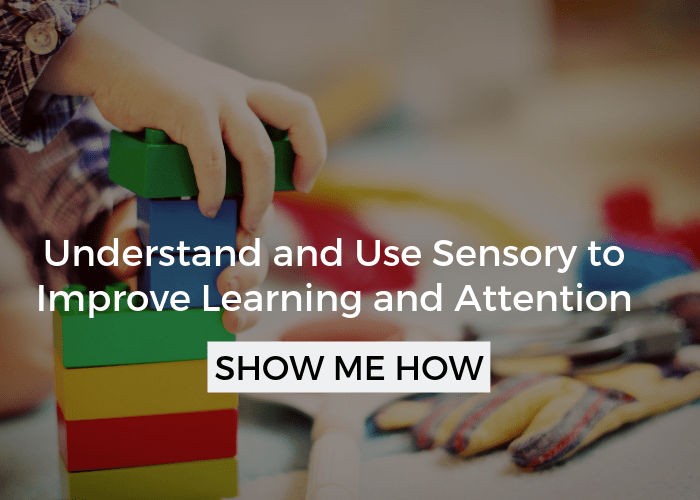 Sensory development – Smelling, touching, seeing, and tasting different textures helps children, toddlers, and even babies to understand more about their environment and how they interact with it. These experiences actually improve their brain development, making it stronger, and will have a direct impact on other areas of their development. 4. 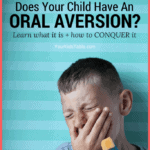 Decrease Tactile Defensiveness – Many children don’t like the feel of different textures, avoid getting messy, and, as a result, are very selective about the foods they will eat. This is often referred to as tactile defensiveness. Cooking with your toddler or child gives exposure to foods they’d typically avoid outside of the often high pressure mealtime routine. 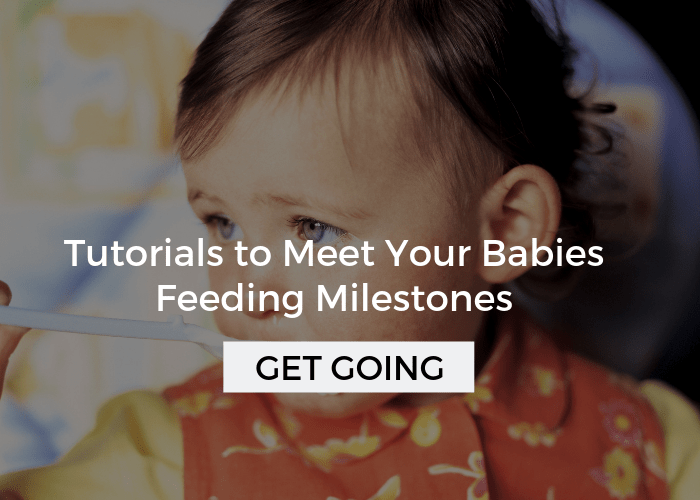 Any small steps kids take with new foods helps to desensitize their sensitive tactile sense. 5. 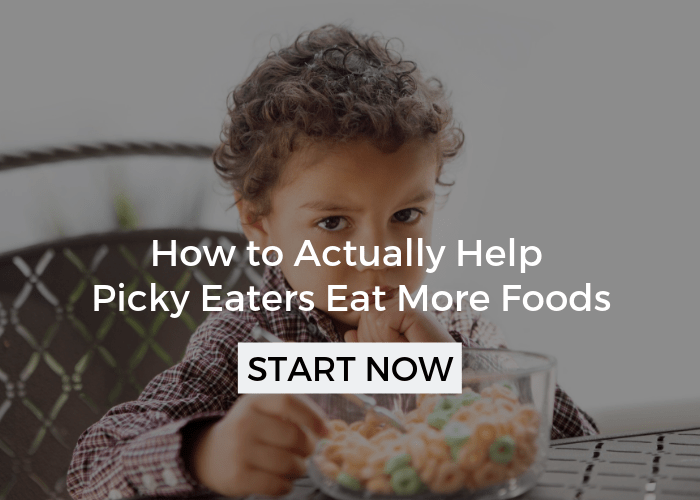 Improve Picky Eating – Cooking together won’t solve all of your picky eating woes, but it certainly can help. 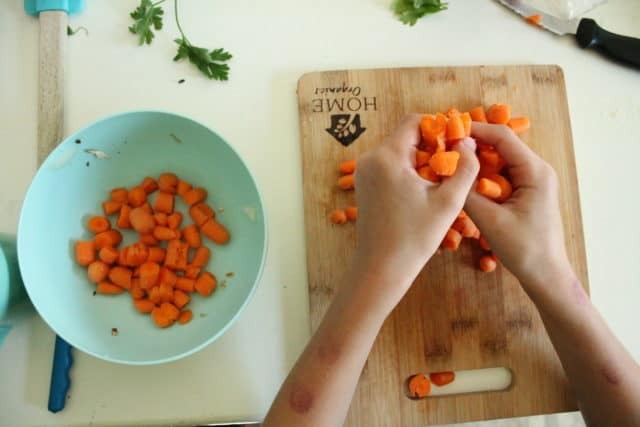 During cooking activities, kids know they aren’t expected to eat and are often more adventurous. Not only in my own kitchen, but many times over as a feeding therapist, I’ve seen picky eaters eat a food for the first time while cooking! Plan for Extra Time: To be totally honest with you, I’ve had more than my fair share of frustrating cooking experiences with my own kids, and every time it’s happened, it’s been because I was in a hurry and not ready to embrace the mess or extra patience needed. Be in the mood: If it’s one of those days where everything seems to be falling apart, then it’s probably not the best idea to squeeze in cooking together or it’s not going to be enjoyable for anyone. You don’t have to cook together everyday! Embrace the mess: You’re cooking with kids and toddlers, it’s a fact that your kitchen will be messier than usual. Flour will be on the floor, outside of the bowl, and on your child’s face. That’s okay, as long as you go into it knowing you’ll need a few extra minutes to clean up! While you can take simple steps (see below) to help minimize the mess, you also don’t want to be freaking out every time a crumb hits the floor. Clear off a cooking space: If you have a small working space or toys, books, and various clutter stacked around, like I often do, clear a spot at the counter, island, or table where you’re free to cook without risk of ruining something if a spill happens. Wear old clothes or an apron: Swap out your kids new shirt for an old one you don’t care about or wrap them up in some aprons (you can find kid sizes here). Have two wet rags on hand: You’ll need one rag to clean up any spills and one to clean up messy hands and messy faces. The latter is especially important if your child does have some tactile sensitivity or defensiveness. While we want them to tolerate different textures, we also want to show them that it’s okay to touch something because you can just wipe your hands off. Use a garbage bowl: Have a large bowl on the counter that they can throw scraps and garbage into. 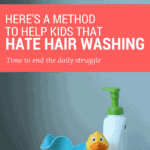 Kids will love helping clean up in this way! Or, you can also bring your garbage can next to your cooking space! 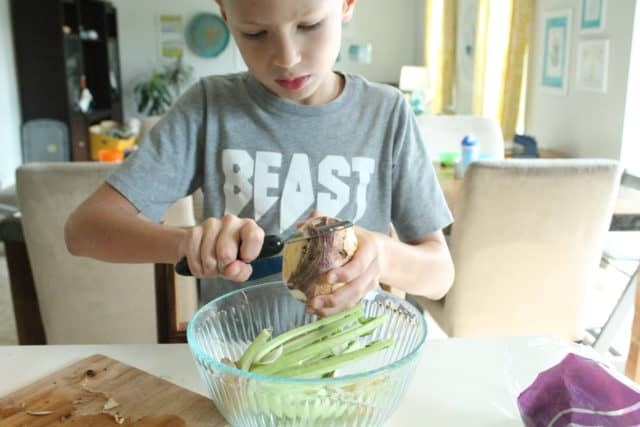 Seize the moment: I know I already said to plan ahead, but sometimes opportunity strikes, and as you’ll see in the list of ways your kid can help you cook below, they may help you with just a few tasks, which is better than no help at all! Just be willing to roll with it if you go this route. Cooking Tasks for Kids and Toddlers! Depending on your child’s age, you may be wondering how they can actually help you cook in the kitchen. You may be worried about the stove or items being too hot. Or, if it’s safe for your child to use a knife. I love this age guide by cooking skill, but below you’ll find a list of practical and generally safe ways to have your child help cook. To make sure we’re being safe with our youngest kids, this second list of activities is for older children and wouldn’t be safe for toddlers. These activities are perfect for kids of all ages, but are safe for toddlers! Choose what you’re cooking or baking together. Flip through a cook book, cut out pictures from a magazine, or scroll Pinterest. Use your best judgement for safety and your own comfort level. There is a safe way to teach kids to use a knife, usually around the age of 5 to 6. I’ve included different recipes in this list to inspire you, but I want to mention that you may want to choose wisely, depending on what your goal is. If you’re looking to simply have fun with your child, then choose whatever grabs your attention, but if you’re looking for your child to tolerate getting messy think about what would motivate them and challenge them a little. For many kids, this is sweets! Just this past week, I made a boxed brownie mix with my son that won’t eat cake because he doesn’t like icing making him messy. Of course, I don’t mind that he’s passing on cake, but as an occupational therapist, I don’t want him getting hung up on textures. So, he picked out a box at the store and was excited to make them for his birthday. He had fun, but I noticed he got nervous if he was mixing and the ingredients were near his hands. I looked for opportunities to encourage him to lick the batter, because this texture is hard for him! 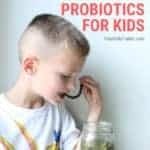 At the same time, you may want to expose your child to vegetables or want to have some snacks they can make themselves. Have your goal in mind as you select some recipes to cook with your toddler or child! Simple Apple Donut Slices Snack – Kids can make this snack themselves and it’s fun! Carrot Cake Smoothie – Easy! Add everything into a blender. Plus it’s immune boosting. 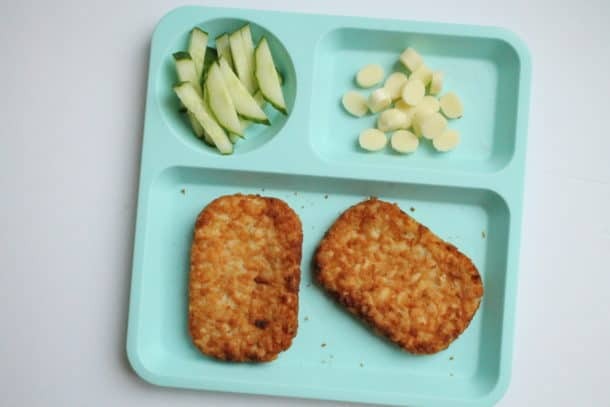 Fish Cakes – A great way to get kids interested in fish. Made Your Way Quiche for the Family – Great way to add veggies if your child likes scrambled eggs! It’s common for parents to tell me that their child refuses to help them cook. If they’re younger, this is likely because of a sensory sensitivity, like we talked about earlier. Older kids may simply not be interested. Either way, there are some tactics you can use to get them in the kitchen with you. Give them a heads up: Let them know in advance that you’ll be cooking something together. For toddlers, you may only need to tell them a few minutes in advance, but older kids may need a couple of days notice or it written on a calendar. Give them a choice: Some kids will respond well with picking a recipe out of thin air, other kids will do better when you clearly offer them 2-3 choices. Try to pick recipes that they’d be interested in initially, even it it’s brownies, before moving onto healthier recipes in the future. Don’t force any particular activity: If your child hates getting messy, they may be scared of cooking. Give them some activities from the list above that they’d be more comfortable with. You may want to start with gathering ingredients instead of greasing a pan with butter. Meet them where they are and take small steps forward as they get more comfortable. Are you ready to start cooking with your toddler or child? This is a go to strategy I use as an OT, but it’s also been some of my favorite memories with my kids as a mom. Have you already been cooking in the kitchen with your kids? What do you like making together? Or, are you just getting started? If so, what recipe do you want to try with your child? Tell me in the comments below!! Grab one of our most popular freebies: 8 Ways to Improve Your Kid’s Eating. 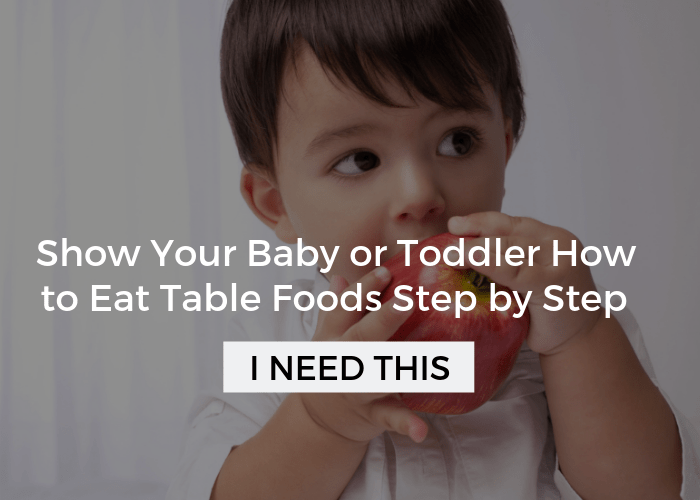 These tips are invaluable and can have a drastic change on the way your child eats! 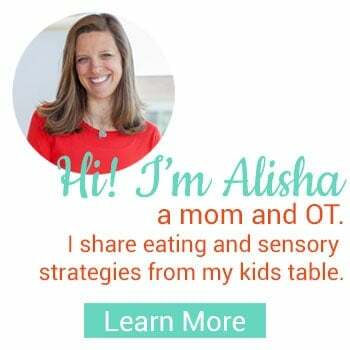 I’ll send it to your inbox and you’ll be added to our newsletter where we share all sorts of info about everything related to kids and food, as well as sensory processing. Click here to get the free printable! There’s a whole lotta info in this post, save it to find it again!